I couldn't read this article and not share my reaction to it. Running, as I've mentioned before, is a sport unlike any other. The competition is with yourself; those you race against are both your competitors and your teammates. Runners form a tribe that both encourages and goads, forcing everyone to give her best. And whether your best is a 14-minute-mile or a 6-minute-mile, if you've put your all into it, that's something to be proud of. All runners get that. When I volunteered at the Cops and Joggers 5k late last fall, I was choked up as faster runners finished the race, then went back out onto the course to encourage others and help motivate them to the finish line. It's one reason I love racing with K, because as fast as she is compared to me, I never feel left behind because she's there at the end, cheering louder than anyone else. 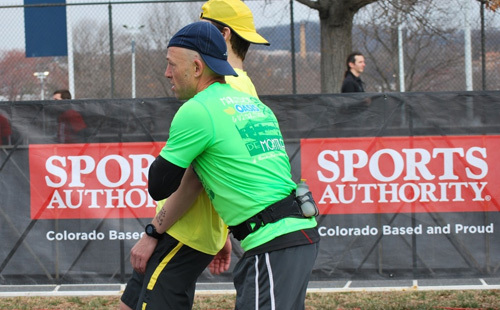 To stop your own race, at mile 26, to help a fellow runner succeed...that is true class right there. Running is a beautiful sport. The most important competition is with ourselves, and the understanding we runners have for each others' struggles is what gives races a depth beyond - I think - any other sporting event. We have all faced a hard race, a bad run, an injury, a mental block. You will see, time and again, runners sacrificing a personal victory to help another runner be a victor as well. Take the Olympic trials this year, when Ashton Eaton clinched the World Record for the Decathalon because Curtis Beach saw the moment for what it was, and waved him to the finish line, sacrificing his own win for a bigger victory for the running world. You can see the moment below (around 1:00 if you don't want to watch the whole thing), and read about it here. The article at hand today showed me once again that fellow runners are the best friends you could ask for, because they have been in the trenches, and they want to see success for anybody crazy enough to fall in love with this sport. What a heartwarming, moving reminder. I am so grateful to be part of this crazy family.